Last week, I asked the community on our Facebook page what they would like us to do a video tutorial on. 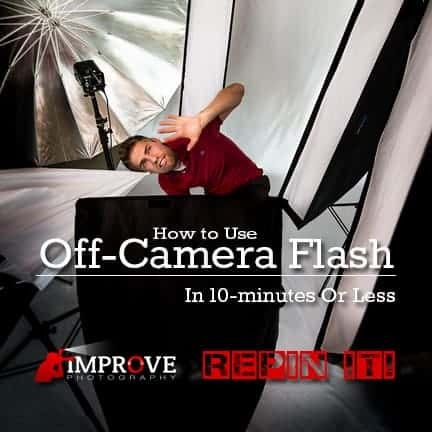 About half of you answered that you wanted to see step-by-step in simple terms how to shoot flash photography. 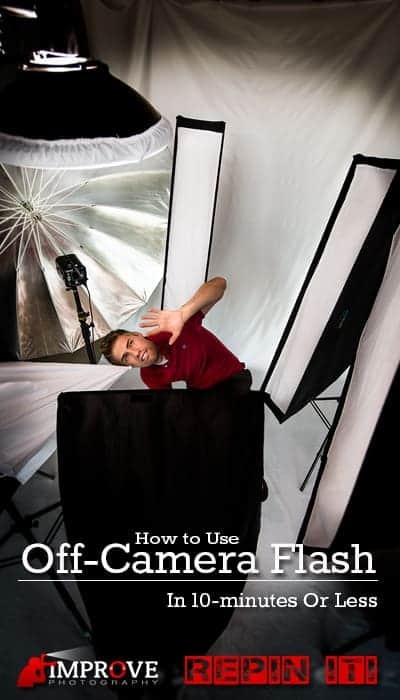 Dustin and I put together this video yesterday to explain off-camera flash photography. In the video on this page, we frequently refer to this article where we give specific gear recommendations about what to buy if you're anxious to learn flash photography. We spent THOUSANDS of dollars on inexpensive flash photography gear on eBay and Amazon over the last year to find the best-quality inexpensive gear, and recommended the winners on that page. Dustin is TERRIFIED of flash. Seriously. I catch him crying in the corner all the time. How Do I Fire a Flash Wirelessly? Off-camera flash is actually quite simple. All you need to fire a flash off camera is (1) a speedlight flash, (2) a trigger/receiver to wirelessly fire the flash, and (3) your camera. If you're note sure what a speedlight flash is, you should read this handy FAQ on flash photography, where I explain some common terms in flash photography. But a speedlight is basically just a small flash that is capable of attaching to the hot shoe on top of your camera, or being fired off-camera. Once you have your speedlight, you need a device to make the flash fire. There are three ways to fire a flash wirelessly: (1) Built-in capabilities, (2) Infrared trigger/receiver, 0r (3) Radio trigger/receiver. Canon and Nikon (I'm not sure about Sony) have both released cameras and flashes in the last year that enable the photographer to fire a flash wirelessly without the need for a trigger receiver. The only trouble with this solution is that they are usually using infrared technology, which has some major limitations because it won't fire without line-of-sight to the flash, and it doesn't do well outdoors when there is a lot of sunlight. Also, infrared won't fire the flash from very far way. The other trouble with using this built-in capability is that it requires the photographer to figure out how to make the flash fire wirelessly by going through the complicated menu system on the camera. The second solution is to use an infrared trigger/receiver system. This means that a small flash trigger device will attach to the hot-shoe of the camera, and you'll put a simple receiver device under the flash to receive the signal from the camera that it's time to fire the flash. An infrared trigger/receiver works just fine indoors, but the sunlight can dramatically impact the ability of the system to fire the flash consistently. Also, I usually only achieve about 20 feet (6.1 meters) between the flash and the camera before the infrared systems start to fail. The last solution really is the best. Radio triggers are amazingly consistent, and will work in any lighting conditions outdoors from 200 yards (183 meters) away. Fortunately, if you buy the off-brand radio triggers/receivers, then it doesn't cost much more than the infrared systems. What Else Do I Need for Flash Photography? Do I Need a Softbox and a Light Stand? You certainly don't NEED anything else to fire your flash off-camera, but you'll soon find that you want a light stand to hold your flash for you, as well as some kind of light modifier like a softbox or an umbrella. If you're not sure what the difference is between a softbox and an umbrella, then read this article. You'll also need a flash bracket to attach the speedlight to the light stand. Don't be afraid of off-camera flash photography! It may seem difficult, but if you simply go out on a limb and buy the basic flash photography gear that we recommend, you'll soon find that it's really quite simple to get started. Once you're ready to learn, you can pick up my “Jim Harmer's Lighting in a Flash” video workshop in the Improve Photography Store. It's a 2 hour video tutorial that you can download or stream. I'll walk you STEP BY STEP through the fundamentals of flash photography. I've produced dozens of video tutorials here on ImprovePhotography.com over the last 5 years, but my “Lighting in a Flash” video tutorial is–by far–the highest quality training I've ever made. I think you'll love it. Check it out here.